Victoria Morales posed in the Bent Tree shantytown (colonia) near the South Texas city of San Benito. Mercedes, Texas – When it rains in South Texas, Norma Aldape worries that dirty water will overwhelm the shantytowns – known as colonias – where she lives tight against the U.S.-Mexico border. With the prospect of climate change bringing more powerful storms more often, flooding is the latest ordeal for 500,000 people in Texas living with little or no drainage in colonias that are largely unheard of further from the border. Residents like Aldape already have had to fight for decades to get basic services such as sanitation and electricity, and tens of thousands still get by without clean water, street lights, paved roads or public transport. But sitting on low-lying floodplains once fields and orchards along the meandering waterway of the Rio Grande, the colonias now face an even greater danger – climate disasters. “Climate change has a huge effect on the poor, especially the poor that live in a place like the Rio Grande Valley,” said Nick Mitchell-Bennett, head of the Community Development Corporation of Brownsville (CDCB), working on housing issues. Hundreds of colonias dot the Valley – as it is known – with about 2,300 in total in Texas and similar but fewer settlements in the border states of New Mexico, Arizona and California. 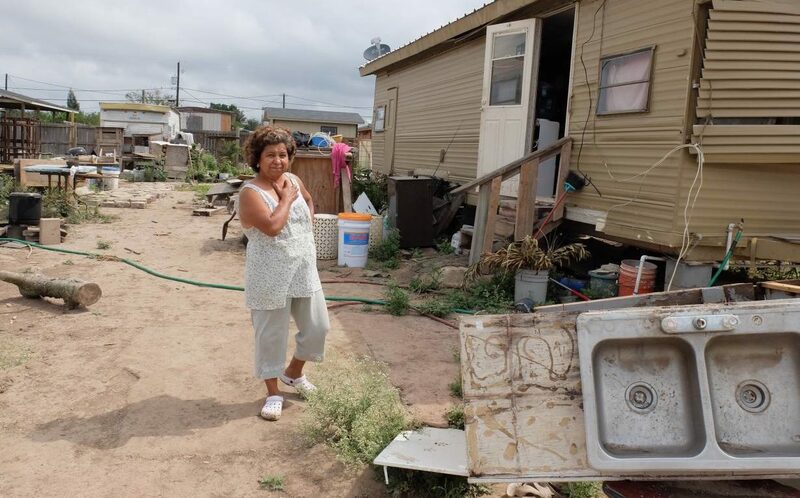 The poverty rate in colonias is three times the national rate, according to the Federal Reserve Bank of Dallas, with residents – mostly legal U.S. citizens – usually buying their lots through a so-called contracts-for-deed scheme. Under these unregulated arrangements, they do not own the land until they make the final payment and struggling residents often turn to high-cost payday loans and car title lenders to get quick cash, accruing debt and trapping them in poverty. Original colonias date back decades, to when landowners sold small lots to low-income buyers, often migrant workers, promising infrastructure that rarely or never materialized. Over the years the close-knit communities got water, electricity and other services but only after years of activism. Groups called La Union Del Pueblo (LUPE) and A Resource In Serving Equality (ARISE) lobbied lawmakers, fought legal battles and demanded government funding, said Jordana Barton, senior advisor at the Dallas Fed, which monitors colonias’ economic conditions. “It was all grass-roots community organizing, and a lot of it was from women,” Barton said. Most colonias lie outside city or town limits in areas largely exempt from building codes that govern safe housing. Some self-built houses consist of little more than tin, cinderblock and cardboard, while others are rusting trailers on weedy lots brimming with tires, car parts and blooming cacti. Newer homes have been built with the help of groups like the CDCB that promotes affordable and resilient housing, but crowing roosters and dogs give colonias the feel of rural Mexico. A group called Proyecto Azteca builds improved housing in colonias – but at a rate of only about 20 homes a year due to budget limitations, said Ann Cass, its executive director. It has a waiting list of 4,000 families. Last summer, Hurricane Harvey devastated eastern Texas, a few hundred miles away, with 50 inches of rain in five days causing disastrous flooding. Residents in south Texas’ colonias fear such powerful storms could hit them next. “In the last four, five years we have seen an increase in the storms, and that increases the vulnerability of these people that don’t have proper infrastructure,” said Martha Sanchez, a LUPE organizer. Aldape, who lives in a colonia in Mercedes, is pressuring county authorities to turn a half-dug drainage ditch in her yard into an effective channel for water. Barton said newer colonias have sewers and other basic services, but residents struggle to pay for them, leaving less money for decent housing. Without working drains, rainwater doesn’t go away – and as it stands it can spread mosquito-borne disease such as Zika. Former Texas Secretary of State Carlos Cascos, whose job once included oversight of the colonias, said government funding to improve conditions should be a health and safety priority. “If it rains, literally everything comes to the surface,” he said. But state help for the colonias is looking increasingly unlikely. Texas, a conservative state favoring minimal, hands-off government, last year eliminated an ombudsmen program that coordinated programs and services for the colonias. ARISE recently worked with one county government to require adequate drainage in new colonias and allocate funds to improve systems in older neighborhoods as well. The measure is pending before local lawmakers. “We could end up with epidemics. We are the United States, and we are supposed to have a much higher quality of life,” said Cascos. Funding for this story was provided by the International Women’s Media Foundation. Thomson Reuters Foundation is the charitable arm of Thomson Reuters, which includes the Reuters news service. The foundation covers humanitarian news, climate change, resilience, women’s rights, trafficking and property rights.